Laminated interior for easy cleaning. The durable rope handles offer a comfortable hand grab. Color accents on the sides and bottom. Appreciate your excellent service. the product is just what I wanted and the salesperson - Rosa - was great. This item was very favorable for all of us at job festivals. 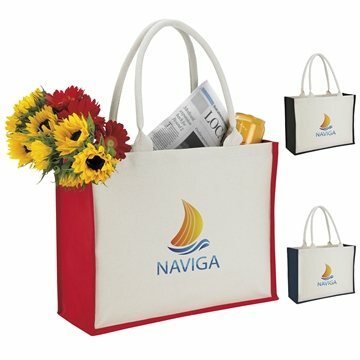 Great tote for your cost.